In honor of National Burger Day, we have listed off our favorite burgers in San Diego! From classic cheeseburgers to crazy creations, we are running down our favorites from all around America's Finest City. Personally, we love the Double-Double Animal Style burger from In-N-Out (a top meal value in California) and the Lounge Burger from Burger Lounge, but for the sake of this list, we are leaving off the any chain restaurants (even though Burger Lounge is, technically, a local chain). 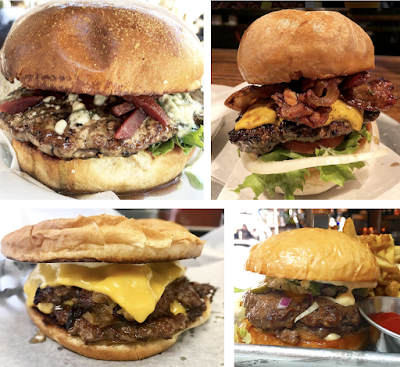 Check out our favorites below and let us know if there are any must-try-burgers that we are missing by emailing Burgers@SanDiegoVille.com. The Balboa Burger, The Balboa Bar & Grill (1863 Fifth Avenue, Bankers Hill) - The Balboa is an unassuming dive bar located on a quiet stretch of 5th Avenue in Bankers Hill with a second location opening in Chula Vista by year's end. This neighborhood spot makes some of the most delicious burgers in town. Their namesake buger is simple perfection, with a patty that is a perfect example of the Maillard reaction in effect and a torta bun that is nothing short of pillowy goodness. This incredible burger is only $5 during happy hour. 1/2 Pound Cheeseburger, Rocky's Crown Pub (3786 Ingraham Street, Crown Point) - With a very limited menu, Rocky's has been a San Diego burger destination since 1977. Long considered one of the city's best burgers, the place just does it right. Rocky's offer a most basic cheeseburger with lettuce, tomato, onion, pickles and mayonnaise. Simple is good. Rumor has it, a glob of frozen mayo stuffed in the patty is the secret recipe here. Don't bother asking for bacon or any modifications unless you want an irksome bartender on your hands. Just get the burger and fries and wash it down with a local brew. Oh, and be sure to bring cash!! The Drugstore Burger, The Lodge At Torrey Pines (11480 N Torrey Pines Road, La Jolla) - This off-the-menu beast of a burger comes with a Niman Ranch all-beef patty, lettuce, tomato, onion and aioli on a sesame seed bun, but you can add a few toppings like bacon, avocado and egg (and you should). The first time we ate this burger we met former President Barrack Obama. Maybe you'll have the same luck. Either way, it's delicious especially if enjoyed with a view overlooking the links. Burger, burger on the wall who's the juiciest of them all? SnackShack Burger, Carnitas' Snack Shack (numerous locations) - With three location in San Diego (North Park, Embarcadero, Petco Park), Carnitas' Snack Shack has become known as a top spot for meaty comfort foods and their burger is no exeption. This juicy patty is topped with lettuce, tomato, white cheddar, shack aioli and bacon jam. The chef & founder is soon opening a "barbecue, burgers and brews" restaurant called The Pioneer in San Diego's Lake Murray area, which will certainly start topping area "best burger" lists once it's up and running this June. HP Burger, Hundred Proof (4130 Park Boulevard, The Palisades) - This elevated take on a Big Mac has two patties topped with English Cheddar, shredded Iceberg lettuce, pickles, onions and garlicy spread. It's a cheffed up burger branded with the initials of the restaurant and is as good as any version you'll find in town. Hundred Proof is a cool spot from the owners of nearby Trust (which also has a bomb burger), who are also in the process of building a new concept in Mission Hills (which probably will also have a great burger). Dirty Flat Top Cheeseburger, The Friendly (452 30th Street, North Park) - Earlier this year, a couple of restaurant industry insiders decided to takeover a longtime North Park pizzeria and do something a bit different. With an ever-changing array of surprising specials (like a "Mexican candy" foie gras) and frequent chef takeovers, The Friendly has become a casual local hot spot. While the NY-style pizza is front and center, it's the burger that has been the real hit. Two patties crisped to perfection on a greasy flat top are topped with yellow American cheese and buttery onions, the bun is toasted on the grill and swiped with garlicky mayo, and the burger only rings in at $5. This is the perfect hangover cure and goes down way too easy. No mods!! Stopped by the brand new @queenstownbistro in @westfieldutc and enjoyed what is one of my favorite burgers in town - the Bare Lil Lamb. Bare Lil Lamb, Queenstown Bistro (4545 La Jolla Village Drive, Westfield UTC) - This recently-unveiled stunner is from the team behind San Diego's other Kiwi line of restaurants (Bare Back Grill, Queenstown Public House, Raglan Public House, Dunedin North Park), and each does a great job with its organic burgers and sandwiches. This specific burger has a New Zealand lamb patty topped with bleu cheese, beetroot, mint dressing, lettuce, tomato, onion, tomato chutney and garlic aioli. Baaaaaaaah! Guido Burger, Hodad's (multiple locations) - Inspired by Diners, Drive-Ins & Dives' host Guy Fieri (who one time named Hodad's the best burger in the U.S.), this behemoth is topped with grilled pastrami, Swiss cheese, grilled onions, pickles, ketchup and spicy brown mustard. Get it at Hodad's OG location in OB, or in downtown San Diego's East Village and Petco Park. Duck Dive Burger, The Duck Dive (4650 Mission Boulevard, Pacific Beach) - This beauty is a half pound beef patty topped with gooey pimento cheese, tomato relish, caramelized onion, lettuce and garlic aioli on a toasted brioche bun, and it's available all day during the week until 4pm for $11.50 with a beer and fries (all night on Mondays). I used to go on a long run down the beach just to enjoy this special without guilt. Feel free to leave out the run and the guilt. La Jolla Burger, The Crab Catcher (1298 Prospect Street, La Jolla) - What a-hole goes to an oceanfront seafood restaurant and orders a burger? This guy! And you should too. This beauty has a charbroiled ground sirloin patty topped with cheddar cheese and dressed with lettuce, tomato, grilled onion, bacon, avocado - all on a toasted onion roll slathered with chili garlic mayo. Get it with a side of crab legs and be a real boss! Psst, get this Groupon and save a few bucks. Hey, CityBeat Burger Week-ers: we open at 10am everyday and our Brunch Burger is always available. Just sayin'. Beat the rush. Brunch Burger, Small Bar (4628 Park Boulevard, University Heights) - This neighborhood craft beer mecca doesn't skimp on quality when it comes to their food. Chef and owner Karen Barnett's brunch burger consists of a house ground ribeye & brisket with duck fat patty, thick cut beer candied bacon, sharp cheddar cheese, and an over medium egg on a Sadie Rose herb & cheese focaccia roll. It's absolutely delicious any time of day! Love burgers? Be sure to get tickets to the San Diego Burgers & Beer Festival, taking place on Saturday, September 8. Promo code SDVILLE saves $5 per ticket!